Everyone has that one boring college wall that you've always wanted to cover over. 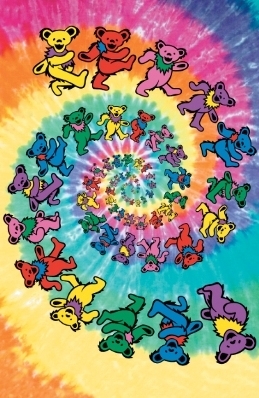 This Grateful Dead - Colorful Bears poster is the solution. With a tye-dye of color, including orange, yellow, blue, purple and green, this dorm poster will be a great addition to your overall layout of dorm room decor. 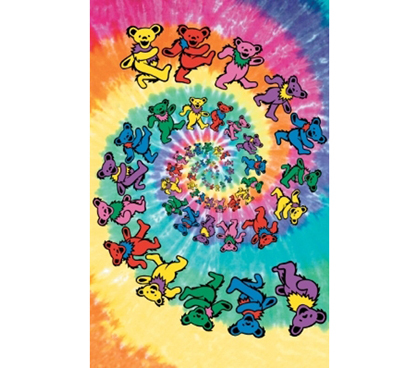 These Grateful Dead Bears will match any dorm layout given the variety of colors. Now you can decorate your dorm with a larger sized poster. This 40'' x 60'' wall poster is really that, wall sized. After seeing how awesome this dorm accent could be, college students always add this cheap poster to their college essential checklist. Being for college freshmen, this poster makes a great graduation gift idea.